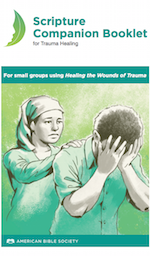 This is the core manual for facilitators and participants in small groups using Bible-based trauma healing to address wounds of the heart and spirit. The 2013 revised edition is now available in English, Spanish, and French from this site (also look for the separate North America edition). Bulk pricing is available. For other languages, please contact us. 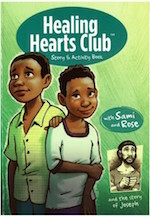 Rose” plus a memory verse and other activities to help children engage with the materials. 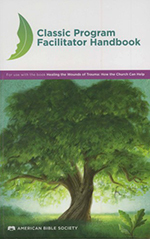 This Classic Program Facilitator Handbook is designed for all facilitators who work with adults. It includes details on leading each lesson as well as supplemental activities not in the Healing the Wounds of Trauma book. 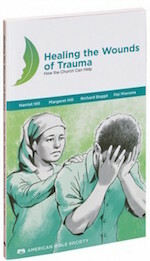 This is the companion booklet for participants in healing groups based on Healing the Wounds of Trauma. It includes the full text of 122 Scripture passages used in the lessons, as well as 138 related Bible references—as well as some key information about trauma and grief from the book. This free PDF is currently available in English and French in both Half-letter and A5 sizes. Use the individual pages on a tablet or e-reader, or print the "booklet" versions double-sided (at 100% scale) to make a saddle-stitch booklet. 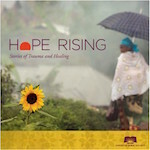 The documentary film Hope Rising: Stories of Trauma and Healing on DVD. This disc includes both 60-minute and 30-minute versions of the film with a brief discussion guide. From Life Focus Communications and American Bible Society. See HopeRising.tv for more details about this production. Helpful brochures about our programs.